This paper explains the differences between common weave types, weave densities, and when they are best used. The first sections below briefly explain the weave types, followed by a discussion regarding when each weave type is generally best used. For more information, please contact us at info@sollercomposites.com. Weaves are generally referred & defined by a notation such as: 2X2, 4X4, and 3X1, for example. The first number in this set, for ex. the 3 in 3X1, refers to how many strands are crossed “over” before going “under” the perpendicular strands (in a 90 degree weave). The second number refers to how many strands are crossed “under” before going back “over” the perpendicular strands (in a 90 degree weave). That is, a 3X1 weave would run: over, over, over, under, over, over, over, under, over, over, over, etc. A 1X1 weave would run: over, under, over, under, over, under, etc. A Harness-Satin, sometimes referred to as: Harness, Satin, or Crowfoot, is defined as any number larger than 1, followed by X, and a larger number. That is, a 3X1 Harness-Satin is referred to as a Harness-Satin 4, H4, or 4HS. A 4X1 Harness-Satin is referred to as a Harness-Satin 5 (5HS or H5), and a 7X1 Harness-Satin is referred to as a Harness-Satin 8, H8, or 8HS. In the H4 weave picture below the weave runs: over, over, over, under, over, over, over, under, etc. Of course there are always exceptions. It is possible to weave a Harness-Satin so it looks like/similar to a 45 degree twill. Commonly if this is done, it is as 3X1 weave vs 3X1 weave that appears to be fairly ramdom. 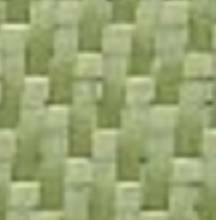 In the case where the 3X1weave is woven to look like very similar to a twill, the fabric is commonly refered to a 3X1 twill. Each weave type has its advantages and disadvantages. There is virtually no difference in the strength of the fabric based on it weave. Choose the weave based on asthetics, how complex your curves are, and the weight of the fabric needed for your application. That being said, every time each fiber bends over or under another, that very small bend in the fiber can makes "very" tiny strength differences. These differences should generally be ingnored and are only mentioned here for accuracy, not for fabric consideration. A plain weave, a 1X1 weave, is the tightest weave. Because the weave is tight, it is the least likely to fray at the ends. A twill weave has that 45 degree, or 3D, "look" to it, which is so often desired. It is much easier to bend around complex curves than a plain weave, because its weave is looser. Therefore, a 4X4 twill will bend around curves better than a 2X2 twill weave. The looser the fabric, the more likely the fabric will fray at the ends and create spaces in the fabric when bent around complex curves. But a loose fabric will fit around complex curves much better than a tighter weave fabric. A Harness-Satin, bends over complex curves better than either a plain or twill weave. An 8-Harness-Satin (8HS) usually has more weaves per inch than a plain or twill weave (defined as “pics”). So a 17picX17pic has more weaves per inch than a 12picX12pic (Don’t [very important] confuse the difference between the weave definition, such as 2X2, with a pic definition, such as 12picX12pic!) So, because an 8-HS has a higher pic count, it will conform to complex curves better than a twill weave, even at the same pic count. The best 90 degree woven fabric for going around complex curves an 8HS. A fabric that easy pivots, or can easy change fiber angle will also fit very complex curves. To allow a fabric to change fiber angle easy, it may be necessary to cut or remove the selvage (typically a kevlar or fiberglass thin leno stitch at the very edge of the fabric). Most flat fabric weaves, such as Plain weave, Twills, Harness-Satins, etc. are woven on a machine called a loom. This machine weave at a 90 degree angle. That is, fiber going lengthwise (warp) & widthwise (fill). So, in general, if you don’t have complex curves and don’t care about aesthetics, a plain weave is the best option. If aesthetics are very important, generally a twill weave is selected, but for a sophisticated look a Harness-Stain H7 or H8 is often used. If you have very complex curves, an 8 Harness-Satin is the best choice. VII. 1K, 3K, 6K, what does it mean? The K refers to one thousand individual strands of carbon per fiber bundle. Each stand is much smaller than a human hair. So, if you have 12 weaves/inch (pics/inch), you have 12 fiber bundles per inch, and in each fiber bundle of 3K fabric you have 3000 strands of carbon. A typical 1K fabric is 3.74oz/sq yard; 3K fabric is 5.7oz/sq yrd. Don't confuse 3Kx3K with 12X12 in a fabric description. The 3K is the fiber size (fiber bundle size), the 12X12 is the number of weaves/inch in each direction. We are often times asking what the thickness and/or width of 1K, 3K, 6K, 12K, 18K & 24K carbon is. The first thing to understand is that carbon fiber tow in most carbon fabric is not twisted. If it was twisted it would be yarn, untwisted carbon fiber is called "tow". Because of the untwisted nature of tow a 3K tow "bundle" will have 3000 individual carbon fiber stands in it. A 1K tow "bundle" will have 1000 individual tow stands in it, etc. Understanding carbon tow is untwisted means the individual fibers can lay in any shape within that bundle. That is, if it was twisted, the bundle would be fairly round with a fairly consistent thickness and width. Of course if you crush the bundle the thickness will compress a bit and the width increase a bit, but twisted fiber is nonetheless fairly consist thickness and width. Untwisted carbon fiber (tow) has no such consistency. All the fiber could lay side-by-side and have the theoretically thickness of 1 stand (typically about 7 micron), they could be bundles together in a round form or (commonly) somewhere in-between these two extremes. Note that the numbers above can and will vary greatly! To make things a bit more complex, Hexcel's IM series of fiber (IM2, IM7, etc) are stronger fiber than standard aerospace grade fibers. So a Hexcel IM7 is much stronger and stiffer than a Hexcel AS4 (640Ksi & 33.5Msi vs. 822Ksi & 40Msi). The Hexcel IM series fibers don't follow the thickness and sizes specified above because Hexcel strips each IM fiber down to it's core to get more strength out of it. What does this mean you may ask then? A 12K IM7 fiber will have the width and thickness of a common 6K fiber. It is common for 12K IM to be substituted for a 6K fiber and sold as a 6K fabric at higher strength in order to keep the same fabric characteristics of a common 6K fabric (11X11pic, 11oz, 0.015": thickness). If this was not done, a 6K IM7 would have the specs of a common 3K fabric, which would confuse most customers not intimately familiar the details of IM7 fiber sizing (yet another confusing fiber fact). So why didn't Hexcel just label 12K IM fibers as 6K? We don't work for Hexcel and don't want to answer for them, but remember that 6K IM7 started out as a 6K, so to relabel it as a 3K would also be confusing and the 6K IM fiber will look different under a microscope than a 3K AS4. So maybe less confusing to the scientists and a bit more for the general public. But at least you are now more informed!